The North Reading Garden Club is sponsoring several youth contests as part of the Garden Club Federation of Massachusetts’ efforts to develop environmental awareness in our young people during their formative years. All contests are open to area youth. “Let the Bees and Birds Help Your Future Garden” is the theme of the poster contest for Preschool (3-5 years) and Kindergarten through 6th grade. All entries must be on paper 12”by 18” and submitted by December 1, 2004. Details are available at the town library. “How Does Your Garden Grow” is this year’s poetry contest title which is open to Kindergarten through 9th grade students and special education students age 6-18 years. One can use his/her imagination to explore different types of poetry to reflect gardening. All entries are due by December 1, 2004. Details are available at the town library. “Forging the Future” - all high school students attending 9th through 12th grades are encouraged to either develop an essay or a speech to explain ways in which one can forge ahead for the future generations while adding personal ideas to the project. The North Reading Garden Club is sponsoring all contestants as part of the Garden Club Federation of Massachusetts. The state winner will be entered in the regional competition and the Regional winner will compete in the National completion. A $1,000 National Council Scholarship will be awarded to the National winner. Local residents Erin McCarthy and Darren Malek have placed at the state level in past years. All entries must be postmarked by December 1, 2004. Complete details regarding contest rules are available through the North Reading High School Guidance Office. For further information regarding any of the above contests you may call North Reading Garden Club member, Charlene Malek 978-664-6763. Judy Colburne received a second place award for her creation in the “Midway” class. This class called for a traditional mass design behind a frame. 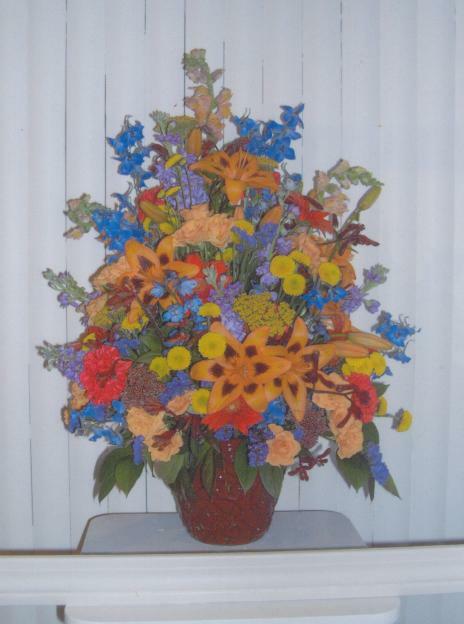 Judy used vibrantly colored flowers (photo at right) in her design to emulate the colors of the midway. Judy, a floral designer at Eric’s Greenhouse in Reading, has been entering her creations in competitions for over 20 years. Joan Crawford received an honorable mention for her design. She also chose the "Midway" category. The North Reading Garden Club wishes to thank all its customers and members for supporting our annual fall plant sale. A special thank you to Sue Kramer for her devotion and hard work on this project. Also thanks to Mary Harshany, plant sale chairperson, Karen Vitale, Lorraine Boucher, Maureen Fields, Nancy Talbot, Deb Spencer, Flo Silvestro, Anna Kleinfeld, Barbara Gillespie, Lisi Lesch, Julie O'Donnell and Ruth Kennedy for their work making the sale run smoothly. We look forward to seeing all our regular customers and lots of new customers at our spring plant sale. Proceeds from the plant sales benefit the club's civic beautification projects. At their June meeting, the North Reading Garden Club installed new officers for the 2004-2005 club year. Former president, Linda Ware has handed the gardener’s trowel to incoming president Nancy Talbot. The other officers are: First Vice President Dot Paicos, Corresponding Secretary Pam Long, Recording Secretary Lee MacNeil, Treasurer Lisi Lesch, and Directors Ruth Kennedy and Joan Crawford. In other club news, the North Reading Garden Club received an award from the Garden Club Federation of Massachusetts. The club received the Helen Friedberg Award for Culture for two workshops lead by club members Sue Kramer and Phyllis Bean on the subject of herbs and their uses in cooking. Additionally, the club received a Certificate of Appreciation from National Garden Clubs Inc. for the club’s newsletter publication. The North Reading Garden Club is pleased to announce the winner of its first scholarship. The club is pleased to award a scholarship to graduating high school senior Michael Salt. "We were very happy to be able to award a scholarship to a graduating senior," said club President Linda Ware. "One of the goals of the Garden Club is to support the community and this is one way that the club can do just that." Michael plans to pursue a degree in physical therapy. Students interested in this scholarship should see their guidance counselor next spring. NRGC Awarded Grant from National Garden Club, Inc. The North Reading Garden Club has received a $300 grant from the Principal Financial Group Historic Gardens Project. The funds will be used to create a perennial garden beside the C. 1900 barn at the Reverend Daniel Putnam House. The work will begin in April 2004. Many plants will be donated from members' gardens. We need volunteers to work on the garden, planting, and weeding. The garden will be a colorful addition to the herb garden that we created at the Putnam House 15 years ago. 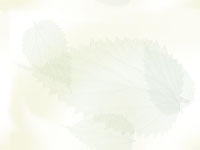 The National Garden Club Inc. established the grants program with the Principal Financial Group. NRGC seeks new members! No experience necessary! Are you interested in gardening and/or floral design? Do you want to learn about these subjects? The North Reading Garden Club is seeking new members who share this common interest. No previous experience is necessary! The Garden Club, established in 1956, has a diverse membership and all interested people are welcome to join. Please join us! New ideas are always welcome!